UPDATE 6/29: Getting reports the Challenge hit… again… but changed. But will wait for more clarification from TinyCo on it. Will Update once I get the results. I have already passed on my thoughts for the Challenge directly to TinyCo. Feel free to do so as well directly from your game messaging. 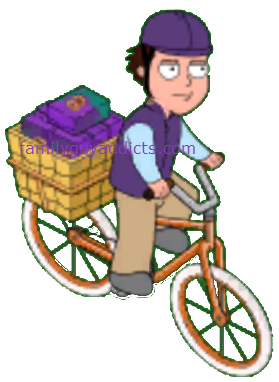 Side Note: Mr Sulu Tapes will now be and ALWAYS drop from Couriers!! WOOHOO!! We now have another Challenge in our games. As usual, Peter will have a ! over his head. Tapping on him will start it. The 3rd Challenge: LEGAL EAGLE! Reminder, these are SUPPOSED to be VERY CHALLENGING! So you will have to spend time, and possibly some Clams to complete them. It all will honestly really depend on WHERE you are in the game itself. If you are starting from scratch, then it will cost you if you want to do it. They are also timed. 24hrs to complete, so watch your timer closely as soon as you trigger it. NOTE: For many, the 1st Challenge triggered by mistake. This Challenges are for only Select Players. If you are one, you will see the Challenge Icon in the Event Menu. If you are not, you won’t and most likely will not see #2 or #3 Challenge trigger. If you have further questions on it, Contact TinyCo. From what I am seeing, you also need to be IN Week 4 content to see it. Each Armored Cookie Truck Requires TWO of the Yakisoba Goons. So you would need 10 of them total. While you are collecting Nunchucks, start hiring them in Copahavana. Each one will take 30 minutes to “HIRE”. 5hrs total to “HIRE” 10 Yakisoba. Each Gurl Scout Requires TWO of the Luchador Goons. So you would need TEN of them total. While you are collecting Luchador Masks, start hiring them in Copahavana. Each one will take 1hr to “HIRE”. 10hrs total to “HIRE” 10 Luchadors. FYI: I know the concerns on the Spawn for the Gurl Scouts. Already in discussions with them on it, especially due to this Challenge. Once the Challenge is done, the Gurl Scouts are set to Phase out and not longer show for Week 4. Will update if that changes or if I hear anything more on the Spawn Rate for them for the Challenge. Per TinyCo… you should see about 3 Gurl Scouts at a time. They will start spawning as soon as you trigger the Timer Challenge needing them. They may take up to 8hrs to respawn, so if you cleared the first batch… check back in again within 8 hrs. They also decided to NOT stop them after the Challenge. For now, they will continue. Each Cookie Courier Requires THREE of the Showgirl Goons. So you would need FIFTEEN of them total. While you are collecting Sequined High Heels, start hiring them in Copahavana. Each one will take 45 minutes to “HIRE”. 11hrs 15mins total to “HIRE” 15 Showgirls. First, the obvious. 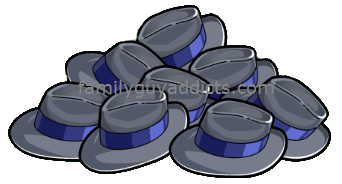 You will need to have unlocked Mr. Washee Washee in your game in order to have access to his tasks. Street Fight will take 12hrs, so I would suggest to send him on his task now, then … if time permits… use him to earn some Nunchucks. That way the task is out of the way. I am still working on completing this, gotta wait for some Gurl Scouts. Will update once I get them in my town and finish it up. UPDATE: Got my last Gurl Scout. 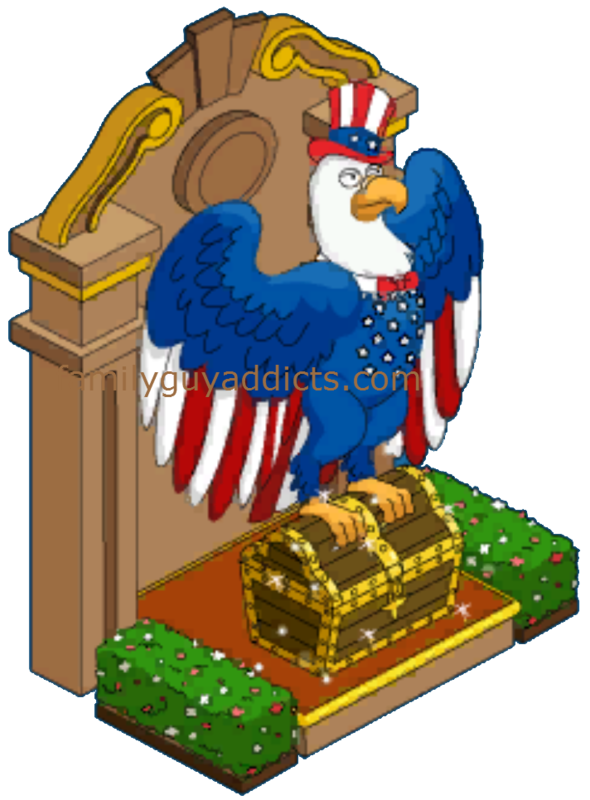 Eagle of Justice: Sits on a 3×3 base, No current animation. This one again will all depend on WHERE you are in the game and WHAT you already have. Keeping Goons in constant supply in my game has really helped me to cut a LOT of time off of these tasks. So the results will all vary on how YOU play the game. REMEMBER: We are here to HELP. This is a HELPFUL post. So please, be understanding and respectful of that and the hard work that we put into getting these kinds of details out to you. There you have it. The 3rd Challenge for the game. What worked for you? How are you tackling this one? Tips for your fellow Players to help them out on this one? Your Strategy for tackling it? Let us know. 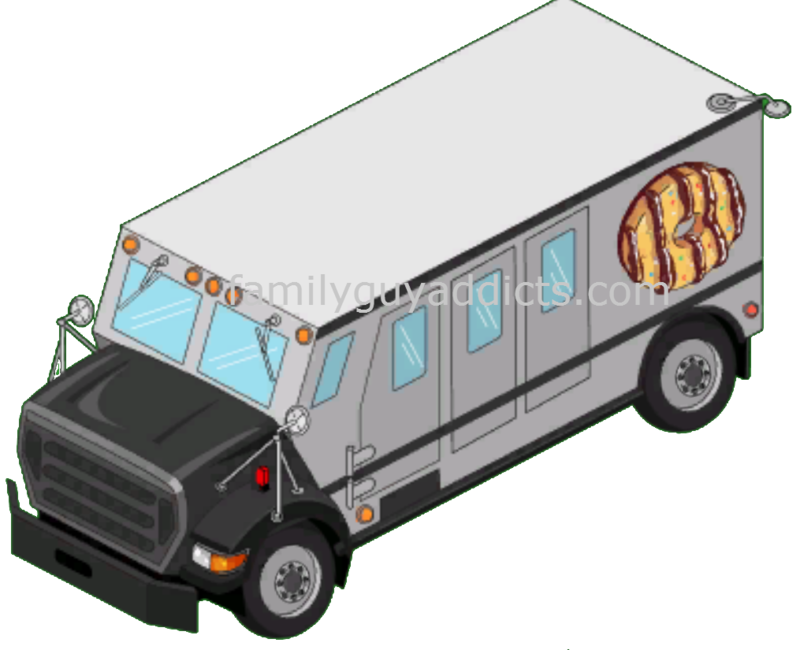 This entry was posted in Decorations, Game Play, Special Event and tagged 3rd Weekly Challenge, Armored Trucks, Cookie Courier, Family Guy Addicts The Quest For Stuff, Family Guy Mobsters Event 2015, Family Guy Tips and Tricks, Gurl Scouts, How do I win the Dragon Statue?, Legal Eagle, Mr Washee Washee, Weekly Challenge. Bookmark the permalink. Is any one else having a problem with the Mr WW street fight? Just completed the 12 hours with him and Peter fighting yet the task has not been cleared. arrrrgh, i had this planned so well with your advice to have luchadors and showgirls pre made and ran the wishy washy street fight over night but it didn’t register!!!!! Now 10 hrs left and i put him on 4hr task! sooo frustrating!! I sent notice to tiny co! I was in the middle of using clams to clear the last two couriers 15 minutes before time out and the server crashed. When I got back on the quest was gone. I sent a message to through help and support and was given 100 clams but I want the chance to finish the quest instead!! Anyone faced the same problem??! Hi, I’m not sure how or why, but somehow I got the Eagle of Justice without even trying. I’m almost a week behind despite playing all the time (took me forever to get Mr. WW to unlock and, therefore, update the Mansion). A few days ago, a pop up happened and it said I got the Eagle of Justice. I just placed it, thinking it was a free item for the 4th of July maybe. Now that I’m upgraded the quest has hit, with nothing done, but under the mobster menu tab it shows as complete. I hadn’t finish the previously weekly challenges, skipping them because they were time consuming, and when I got the Eagle I didn’t even have the armoured cookie trucks. Just thought I’d mention it as it seems odd, maybe a glitch if you were behind? Has anyone else reported this happening? There was an alternate glitch with it, but it did not complete it. mine is also 6 armored trucks/7 girls scouts/5 couriers (31.25 hours) plus washee washee…..hope something comes out in the washee washee…. 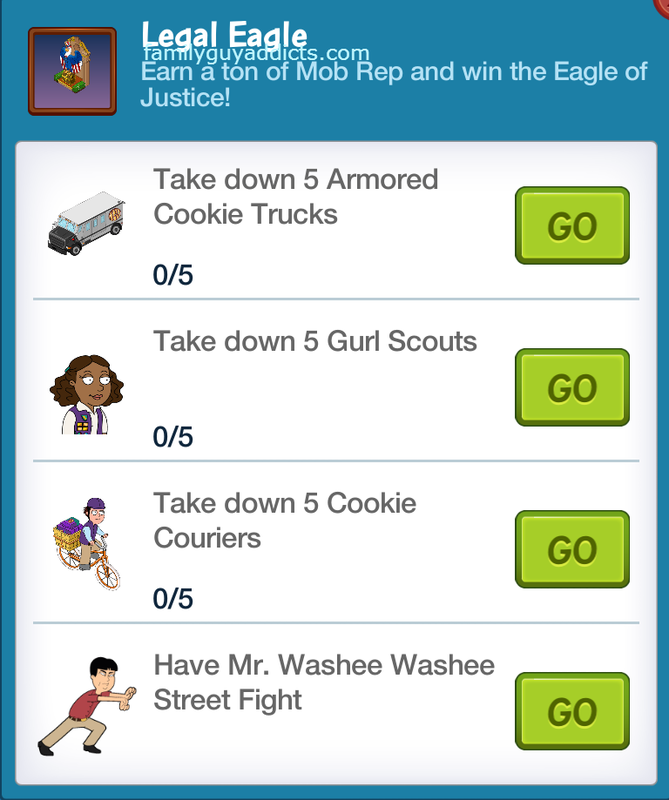 So,I just wanted to post that In my game for this it asked for 6 armored cookie trucks,take down 7 gurl scouts, take down 5 cookie couriers. And have MR.washee washee street fight. The Picture of only needing. 5,5 and 5 is not true. Luckily I had some clams to speed threw a few of my characters or I don’t think this would have been possible. I’m disappointed that the only way to complete this is by spending clams – which doesn’t seem worthwhile. I started it, then gave up when I realised it was not possible. Back to the regular game, then! Yep, it’s now 31.25 hours of full-time crafting in a 24 hour window. That said, at this stage you should have 12 goon slots, and given the advance warning from the quest popping early for some, if you weren’t rocking 6 Luchadors all the time, you’ve done yourself a great disservice. I think I’ll need to clam the last hour or so. Depends on how long I sleep tonight, I have 1.5 hours from when I wake up to when the timer ends. All in all, I’d say these challenges are a bit more focussed at the money-grab. By making them premium players only, and making them take more time than allotted for the challenge I feel they’re targetting people who they know will pay for cosmetic stuff. Previous events have been hard, but possible for free. This one is not. Cleared it with an hour to spare. I woke up at 0230 by chance, so was able to queue up a couple more dancers. winning. Wait, I just got this challenge activated. Made calculations and all with this info. But wait! Mine says I need6 armored trucks and 7 girlscouts? WTD? Anyone else seeing different requirements for this quest? Are the tape drops from the couriers still and always drop? What about the T-shirts from the scouts? I still need so many of these. Thanks for the info. Can I play on both devices (iOS and android) yet, or are they still both on different updates where I have to choose? Thank you. Mob wife Bonnie and clear fat people on scooter. That’s the spoiler for week five if that’s what you’re asking.